The traditional peasant dish gets an easy, delicious upgrade with this Quick Cassoulet. Made with chicken sausages, bacon and white beans, plus ready in a fraction of the time, this Cassoulet will help you beat the winter blues! Hi-ya friends! Happy Galentine’s Day to all you ladies out there! And Happy ONE DAY until Valentine’s Day to everyone! Aaaaand Happy Monday? <– That’s for all you glass half full type of folks. How was your weekend?! Was it stupendous? Did you spend it planning out some sort of elaborate shindig for you and your besties to kick back (lady-style) and celebrate tonight? Or maybe you spent it picking out the perfect gift to give the love of your life tomorrow? Possibly something in a Tiffany Blue colored box? Ooooor maybe you are like me. And you didn’t do any of those things. Oops? Wait wait waaaaaiiiiiiit! Before you judge me, just know I’m not really a Valentine’s Day type of chick. It’s not that I’m ANTI Valentine’s Day. And, I definitely welcome gifts on any occasion. I just don’t reserve my love for Boy to only one day a year. He gets my love, and all my annoying glory, 365 days a year… and 366 on a leap year. Going out to dinner is totally overrated. I mean, the crowded restaurants, wait times, and the over-priced food. 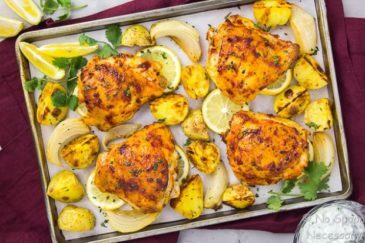 You should show your loved one how much you care and COOK FOR THEM! Now that we have all that covered, let’s get down to today’s business – food totally unrelated to Valentine’s Day. Also known as your new favorite comfy, cozy dish. Which also happens to be super quick and excellently easy. BUT, before some stickler out there gets their knickers in a twist, let me just say this is NOT a traditional cassoulet. It IS, however, the best imposter. EVER. And, if you ask me, this cheater’s cassoulet happens to be BETTER. LESS TIME. No waiting for the meat and beans to braise for hours. With this cassoulet you get scrumptious satisfaction in a FRACTION of the time. LESS CALORIES. Most traditional cassoulets are made of various sausages and preserved meats. 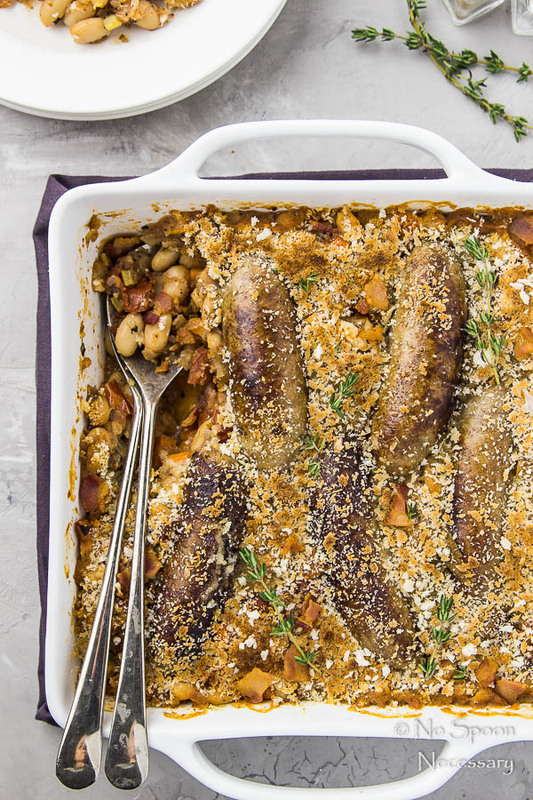 But this cassoulet is made lighter and healthier with chicken sausage. This means you can eat MORE, which is always a win in my book. 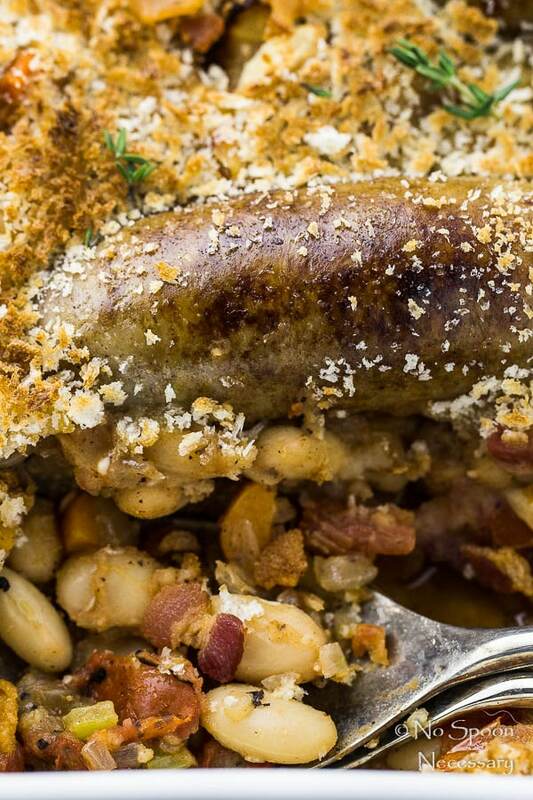 Now that we’ve covered how awesome this cassoulet is, let’s describe how AMAZING it TASTES. 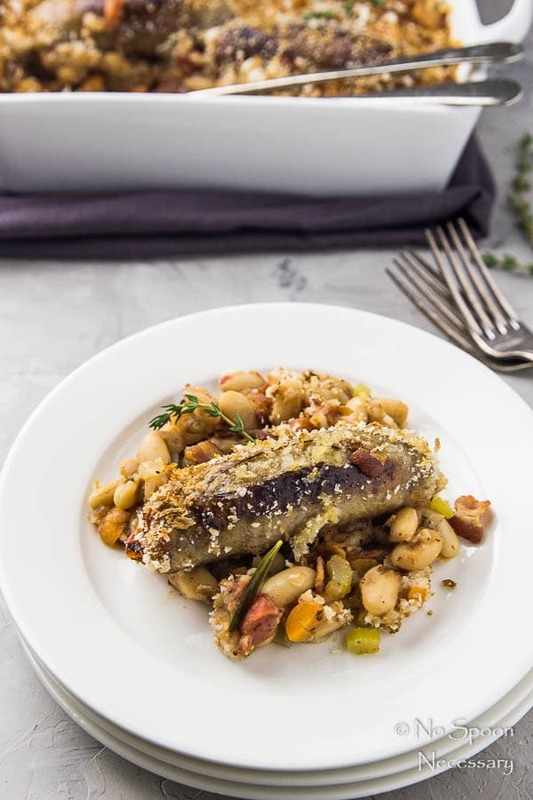 Juicy, plump, slightly sweet apple flavored chicken sausages lovingly snuggled into a stew-like mixture of tender white beans, crispy, salty bacon, earthy herbs and tender veggies; topped with crunchy panko and baked until bubbly perfection. This skinny cassoulet is savory-sweet, comforting BLISS. A cassoulet, pronounced kas-uh-ley, is a rich, stew-like casserole which originated in the south of France. There are many different versions of a cassoulet casserole, but in its most simple form it is made with meat, white beans and herbs. 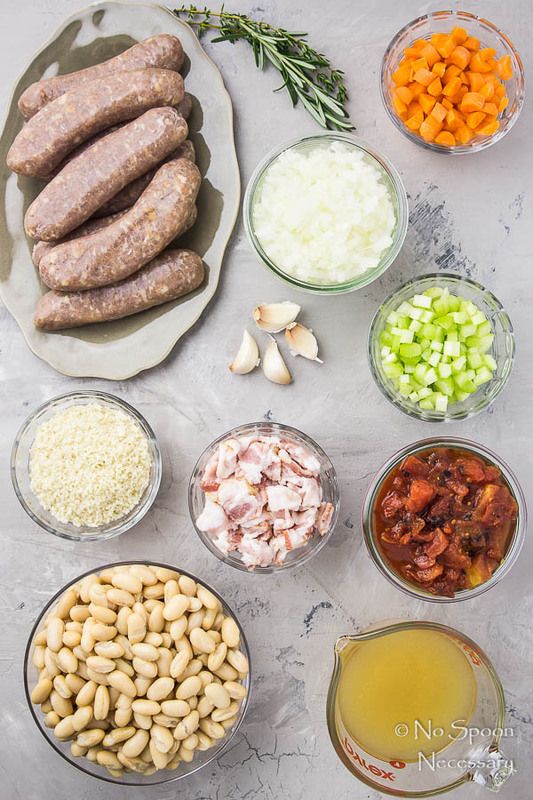 While some varieties use pork or duck, and others goose or mutton, this quick cassoulet uses chicken sausages and bacon. The word cassoulet is derived from the actual traditional earthenware casserole in which it is cooked, known as a cassolle or cassolo. Originally a cassoulet was cooked in a cassolle in a hearth, or bread baker’s oven, using low, residual heat. First are going to heat a couple splashes of olive oil in a large skillet until glistening. Throw in the chicken sausages and cook them until they are cooked through and golden brown on all sides. Remove those to a plate and set aside. Next, you will add in the diced bacon and cook until crispy and the fat is rendered out. Use a slotted spoon to transfer the bacon to a small ramekin and set aside. Then, add the onions and carrots to the skillet and sauté those in the bacon fat until softened. Add in the celery, then the garlic and cook until fragrant. Pour in the beans, some broth, a bit of wine and some fresh herbs, then bring everything to a simmer. Reduce the heat and let that do its thing for a beat. Dump in the tomatoes and let that hang out for a minute. Stir in the bacon, snuggle the chicken sausages into the bean mixture, sprinkle everything with panko and transfer the skillet to the oven. Bake the cassoulet until everything is bubbly and the top is golden brown. Pull the chicken cassoulet from the oven and garnish it with some more fresh herbs. Grab a loaf of crusty bread and DEVOUR. 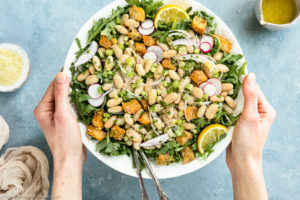 If you are looking to pinch a few pennies, you can absolutely use dried white beans instead of canned. Just make sure you soak them and cook them prior. While chicken apple sausages taste absolutely DELICIOUS in this dish, you can substitute any type of sausage you would like. Just make sure to follow the recipe and cook them fully before adding them to the cassoulet. The white wine in the recipe adds a nice depth of flavor, but you can skip it and just use all chicken broth if you would like. You can make this cassoulet RIGHT IN the skillet (as I instructed in the “how to make this” section above). OR, you can transfer everything to a casserole dish before baking. I transferred mine for photography purposes only. I suggest you just bake it right in the skillet for easy clean up. 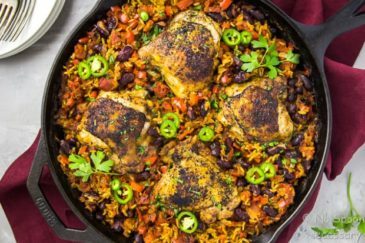 Just make sure you use a LARGE, STRAIGHT-SIDED, OVEN PROOF skillet (a cast iron skillet works wonderfully here). If you want your panko topping to get extra brown and crunchy, you can switch the oven to high broil during the last couple minutes of baking. Just make sure you watch the cassoulet carefully as it can go from golden brown and delicious to burned in a flash! 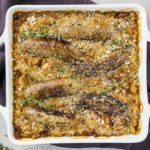 Hearty, comforting and oh-so delicious, this Easy and Quick Cassoulet will definitely help you beat the winter blues! Until Thursday friends, cheers – to a wonderful Galentine’s and Valentine’s Day! The traditional peasant dish gets an easy, delicious upgrade with this Quick Cassoulet. 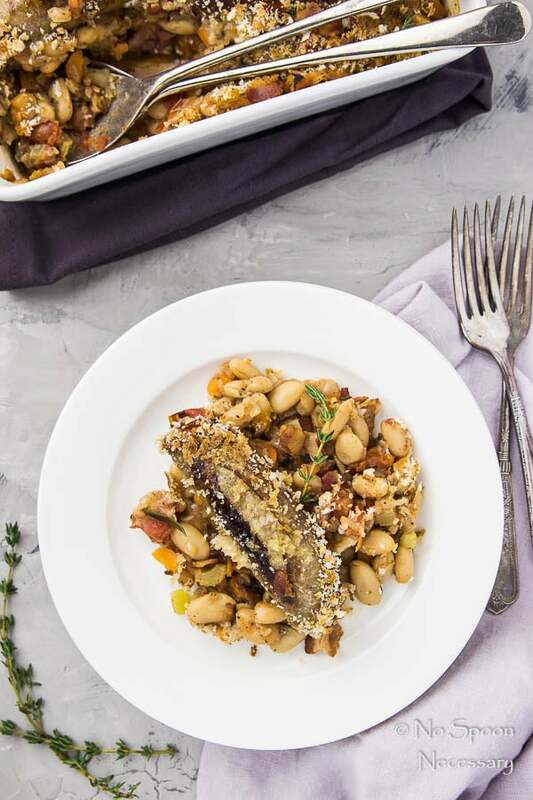 Made with chicken apple sausages, bacon and white beans, AND ready in a fraction of the time, this Cassoulet will help you beat the winter blues! Preheat oven to 350 degrees F and grease a 9’’ baking dish. Set aside. Heat 2 tablespoons of olive oil in a large, straight sided, oven proof skillet over medium-high heat. Add the chicken sausages and cook, turning frequently, until golden brown and cooked through, about 7-9 minutes. Remove from skillet and transfer to a plate. Reduce heat to medium and add the bacon to the skillet. Cook until it starts to crisp, about 5 minutes. Use a slotted spoon to transfer bacon to a small bowl or ramekin and set aside. Drain off all but 2 tablespoons of fat from the pan (add more oil to get 2 tablespoons of fat if pan is dry). Add the onions and carrots to the skillet. Season with salt and pepper. Sauté for 3 minutes, then add the celery. Continue to saute, stirring, until celery is softened, an additional 2 minutes. Add in the garlic and cook until fragrant, about 1 minute. Add in the beans, broth, wine, thyme and rosemary. Bring to a simmer. Reduce heat to medium-low and cook, stirring occasionally for 10 minutes. Add in the tomatoes. Increase heat to medium-high and bring to a simmer again. Immediately reduce heat to medium-low to maintain a simmer. Cook, stirring frequently, for 5 minutes. Stir in the bacon. Taste and adjust for seasoning with salt and pepper. Remove thyme and rosemary sprigs and discard. *Optional: Use a large spoon to transfer half of the beans to greased baking dish. Use tongs to transfer the chicken sausages on top. Evenly spoon and distribute the remaining beans into the dish. Sprinkle the panko evenly on top and transfer to the oven. Bake for 20-25 minutes, or until beans are bubbly and panko topping is golden brown*. 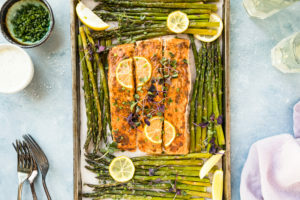 Let cool slightly before serving, garnished with fresh thyme and rosemary leaves. 1. If you are looking to pinch a few pennies, you can absolutely use dried white beans instead of canned. Just make sure you soak them and cook them prior. 2. While chicken apple sausages taste absolutely DELICIOUS in this dish, you can substitute any type of sausage you would like. Just make sure to follow the recipe and cook them fully before adding them to the cassoulet. 3. The white wine in the recipe just adds a nice depth of flavor, but you can skip it and just use all chicken broth if you would like. 4. You can make this cassoulet RIGHT IN the skillet (as I instructed in the “how to make this” section above). OR, you can transfer everything to a 9x9’’ casserole dish before baking. I transferred mine for photography purposes only. I suggest you just bake it right in the skillet for easy clean up. 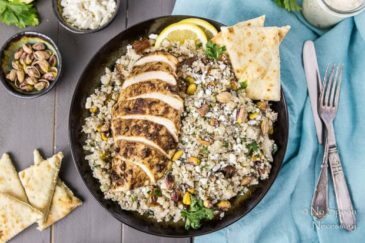 Just make sure you use a LARGE, STRAIGHT-SIDED, OVEN PROOF skillet (a cast iron skillet works wonderfully here). 5. 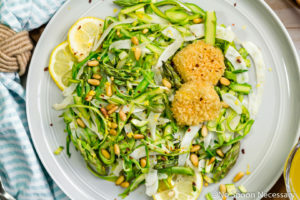 If you want your panko topping to get extra brown and crunchy, you can switch the oven to high broil during the last couple minutes of baking. 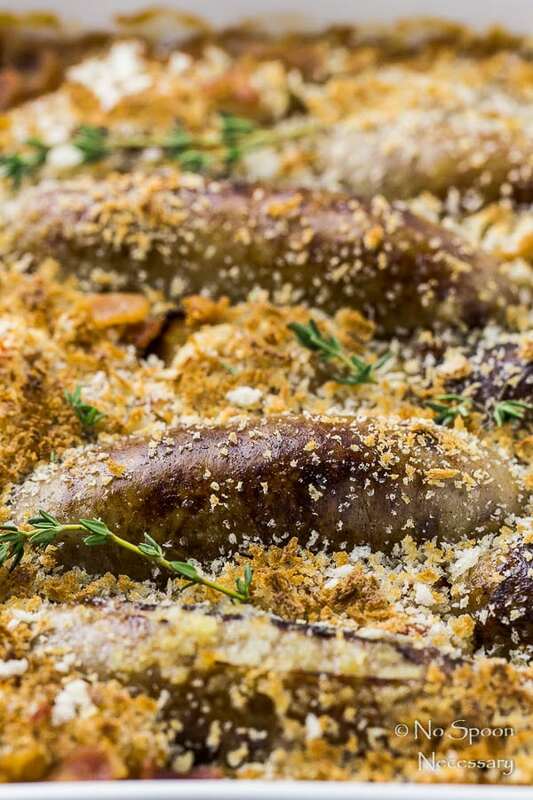 Just make sure you watch the cassoulet carefully as it can go from golden brown and delicious to burned in a flash! Keith and I are big fans of cassoulet, but I’ve never made it at home because it always seemed so complicated. But look at you! You’ve made it manageable and it looks totally mouthwatering. I am ALL about this, girl!!! I just bought a big package of chicken apple sausage at Costco today so it was pretty much fate 🙂 totally gotta make this deliciousness for dinner soon. 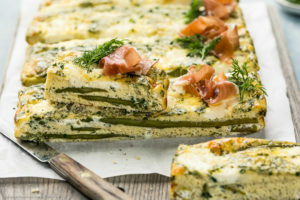 Now if only I could snap my fingers and this would appear for dinner tonight! haha Sounds fantastic!! We’re not really big valentine’s day people either. I was planning to cook but then somehow we wound up last minute at the restaurant that gets ALL our money down the street 😉 haha I mean, it’s not our fault when you see a reservation open up literally 30 minutes before hand! yup cooking at home is the best and that’s exactly what I did for Valentine’s Day – cooked for him! 🙂 This sounds lovely Chey! hope you had a wonderful V day! 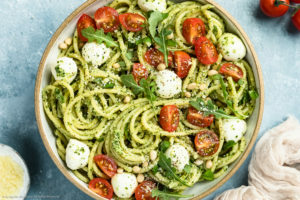 This looks downright DELISH and not as hard as one might think. Love sautéing in the bacon fat too. Gotta use that whenever you can! Pinning this one to try later. I’m making us some Balsamic Pork Tenderloins for din din tonight. Thanks Chey! This looks lovely. 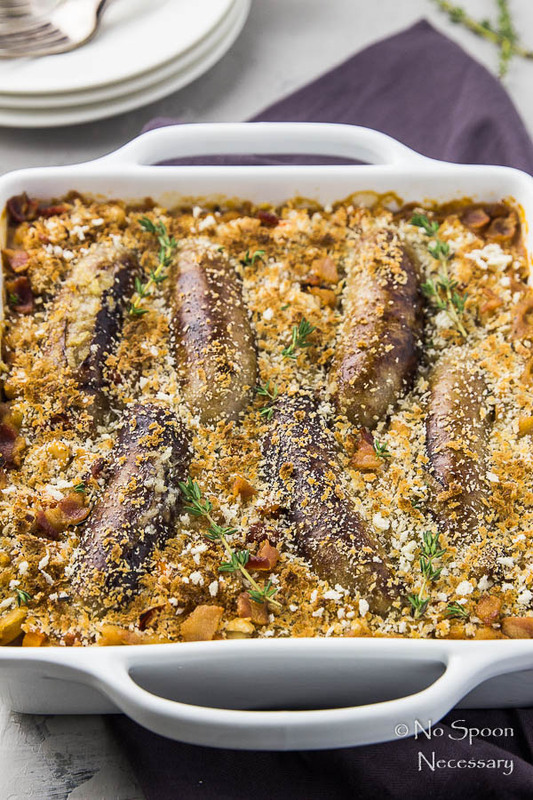 I love a great chicken apple sausage and using it in a cassoulet is a great idea! I’m with you on Valentine’s Day. It’s fun and all, but I’d much rather have a great dinner at home than go to some fancy restaurant and fight the crowds! Home cooking is so much better! Imposters don’t get enough love!!! We are hours from Valentine’s Day and well, I have a household of sickies. 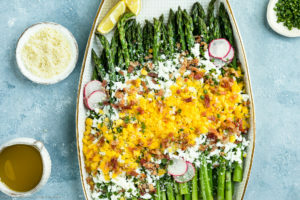 Maybe this is just the dish to get my husband to crawl out of bed and make it to the dinner table! He won’t be able to resist the aroma of sausage and bacon. Happy Galentine’s Day! Chicken, apples, sausage, beans?! Wow, what a truly one dish meal and really delicious and flavorful, apples and savory are a favorite!! I love cooking one dish meals, they make me feel like June Cleaver, that picturesque housewife, the kind before yoga pants were invented 😉 . Take care. Girl, you always blow me away with your creativity! You make me feel so boring! Lol. 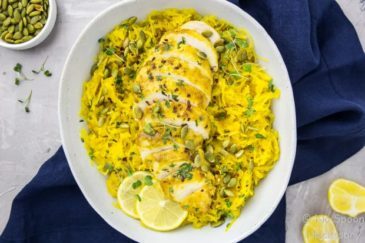 This is a brilliant twist and SUCH a gorgeous dish! Valentine’s is a lovely (Although highly commercialized) day. But you’re right – it’s just one of 360-something days to show your love. And indeed, I believe it should be celebrated at home, with a light and delicious (and perhaps a little bit fancy) meal. 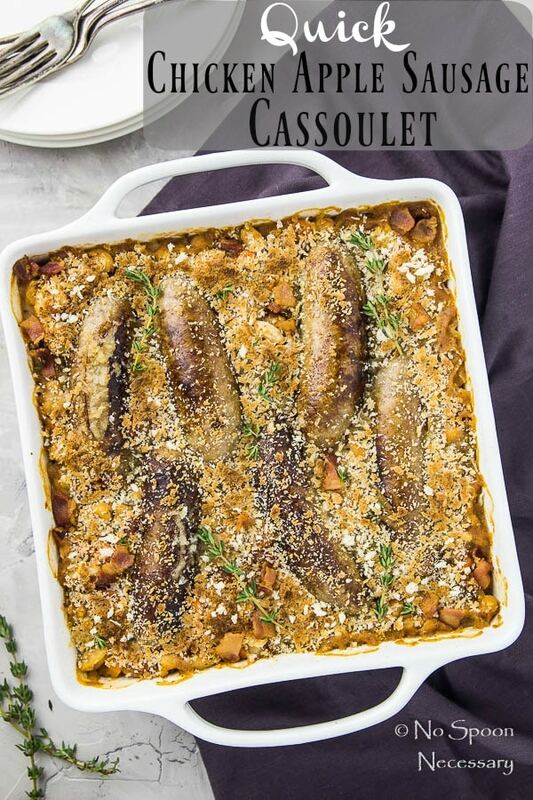 I’ve never had a cassoulet (I’m not sure I’ve heard this name either), but this combination sounds fantastic!